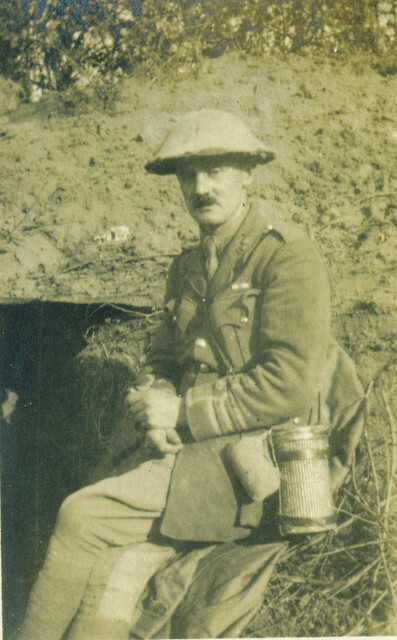 This photograph is from the same gunners photo album that yesterdays came from; the owner was an officer in the 218th Siege Battery Royal Garrison Artillery on the Hindenburg Line in 1918. The image of ‘The Major’ who is not named, gives a good insight into the way officers dressed in the last phase of the war. The old ‘cuff-rank tunic‘ with the officer’s rank on the cuff, which had cost some many young officers their lives in 1914 and 1915 had seen a resurgence and the Major is wearing his here. He has a sandbag covered helmet to reduce the shine in bright conditions, and straps indicate a map case on one side. Nearest the camera the Major has the container tin of a French gas mask held in a leather sling, with a first field dressing attached to it. The British gas mask could not fit in this tin, so we can only speculate what might be in it – perhaps a whisky flask?! 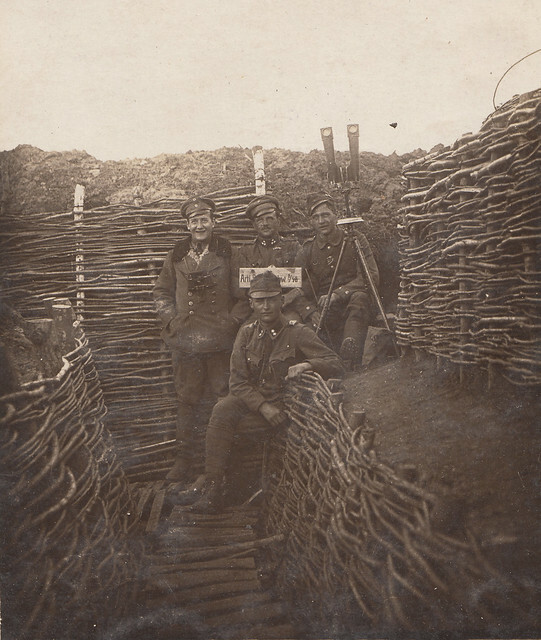 This image comes from an album belonging to an officer who served in 218th Siege Battery Royal Garrison Artillery. The pictures are all small, which may indicate a Kodak pocket camera which seem to have been fairly common in the late war period. The officer served with the unit in the final months of fighting on the Western Front and took a number of photos of battlefield areas on the Hindenberg Line. 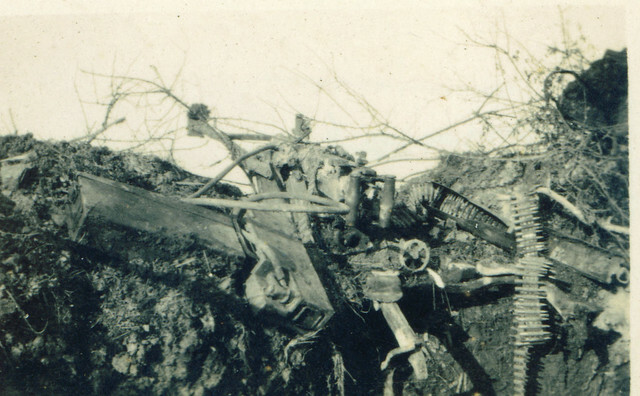 This image shows a German MG08 on the lip of a sunken lane somewhere near the St Quentin canal area in October 1918. This was the standard heavy machine-gun of the German Army in the Great War capable of firing 400 rounds a minute. An ammunition tin is seen on the far left and next to it nearer the gun is the condenser tin; this was connected to the gun by a leather hose and condensed the steam in the guns water-cooling jacket back into the tin where it could be used to refill the jacket for the next shoot. The positioning of the gun suggests a good field of fire beyond the lane, but it’s less than permanent position is also typical of German defences in the last phase of the war as the Germans were being defeated and thrown back, and could not rely on the sort of entrenchments they had prepared earlier in the war. 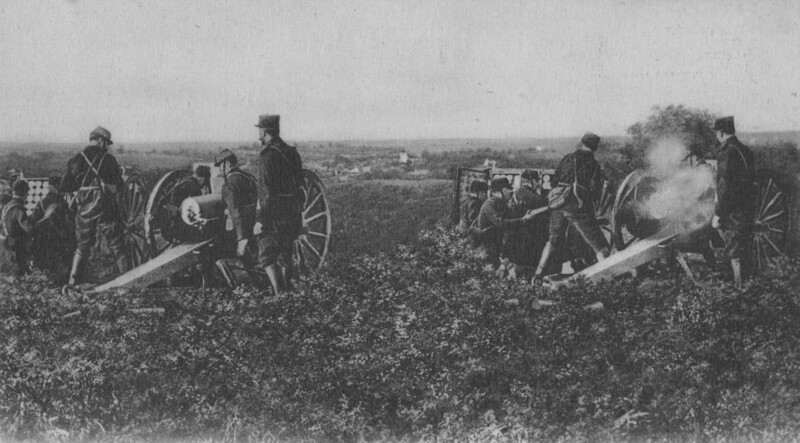 The French 75mm Field Gun has often been called the artillery piece of the Great War. Brought into service in the last years of the nineteenth century, it had a unique recoil mechanism which meant that it could fire between 15 and 30 rounds a minute without the gun moving. Normally a field gun had be re-positioned to fire after every shot; the 75mm could deliver a huge rain of shells precisely in a short space of time, which gave the French Army the upper hand when the war turned to stalemate and artillery dominated the battlefield. In 1914 more than 4,000 were in service and by the end of the war more than 12,000 had been produced. 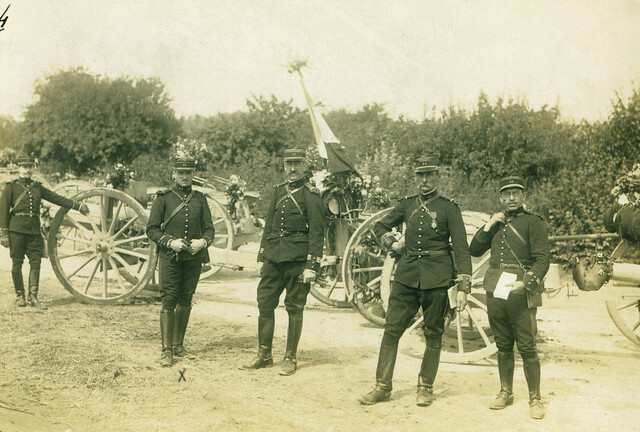 This image shows men of the 44th Regiment d’Artillerie of the French Army either just before the war on manoeuvres or at the time of mobilisation in August as it is dated 1914 on the reverse in pencil. The 44th was from Le Mans in France and weeks after this photo was taken, the unit was in action during the Battle of the Marne, where the German Army was stopped in its tracks at the very gates of Paris. 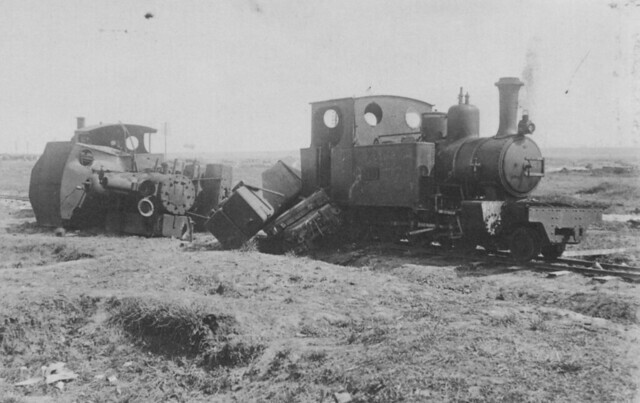 It spent the winter of 1914/15 near Reims getting used to being dug in as Trench Warfare developed, and in 1915 took part in Operations in the Champagne. In 1916 it fought at Verdun, and in 1917 was back on the Marne before returning to the Champagne in 1918. The men in the photograph are officers of the 44th; they are wearing the pre-war uniforms of blue serge and in field service attire with the equipment needed to do their job as gunner officers; map cases and binoculars. The officer second from right is likely to be either the 44th’s commander or a Brigade commander within the 44th; he is wearing the Legion d’Honneur, France’s highest decoration which could be awarded for general duties as well as for gallantry in the field and may just indicate he had some service in the army. Sadly no names are appended, but one wonders what sights and sounds these men experienced only weeks after this image was taken, and how many of them survived that long journey from the Marne back home.